This ordinary looking home in Koszalin, Poland might seem like just a normal small house in the neighbourhood. Its traditional exterior, with its terrace and natural exposed wooden panels, reveals little other than a family home. However, the architecture team at Studio Projektowe Projektive have transformed this ordinary home into an extraordinary experience. While the exterior ticks all the boxes of a regular home, inconspicuous amongst the other houses on the street, the interior has taken a more futuristic approach to both form and function. This home has a completely different indoor aspect, which will leave you astounded by some of the forward-thinking elements. The shell of this house hides so much of the interior, the large windows located throughout almost allow us to catch a glimpse of what's inside, but this home has an almost introverted feeling to it from the outside. 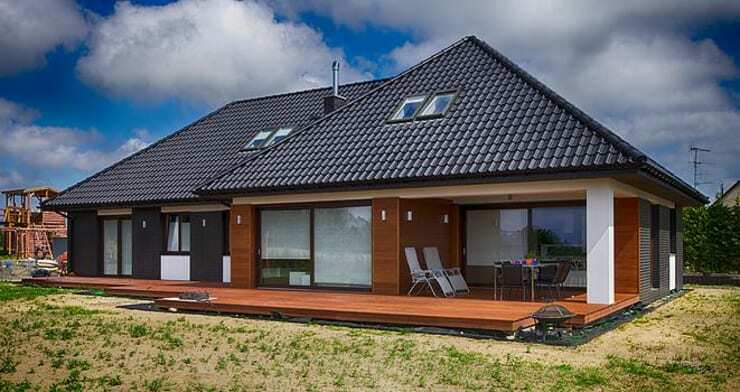 Although the wooden panelled walls and deck surrounding this home, provide an almost fun and flirty appeal, even though the darker roof tiles add a more modern touch. This exterior façade blends older traditional style with a minimalist finish to create this fusion home filled with unusual characteristics that make it distinguished from other houses situated in the residential area. It may not show off much to the outside world, but the use of natural and neutral tones to the exterior, gives this home a more modest touch. After stepping inside this dramatic home you instantly get a feeling that you've come to know the inhabitants a little better, almost as if you've stepped into their psyche. The clean lines, polished surfaces and out-of-this-world lights add so much more to the drama. The entrance doesn't hold back with the shining silver lights on the ceiling that are so gorgeous and fascinating, added to that are the neutral tones used throughout from the floors, to the wall and even the stairs. Giving the illusion of wide open spaces. 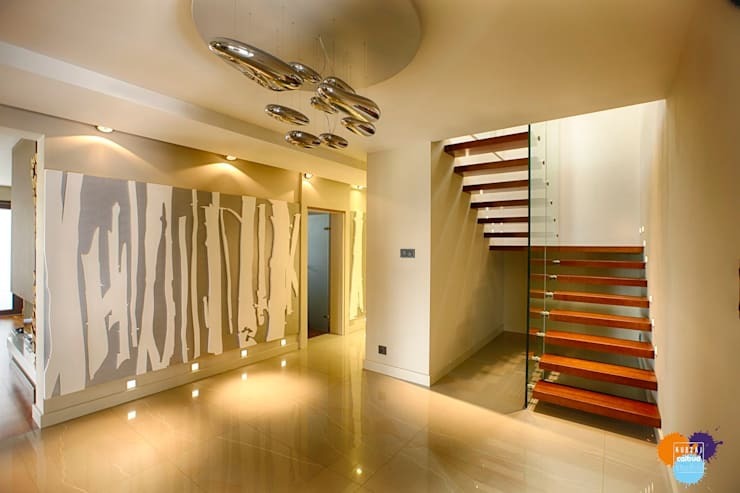 The simple nature of the stairs with the glass panel and almost floating steps work so effortlessly together. And have you had a look at the spectacular wall art? Although the art piece blends in so well with the neutral and natural tones included throughout the entryway, it doesn't stand out in an abstract way. Which is a good thing! 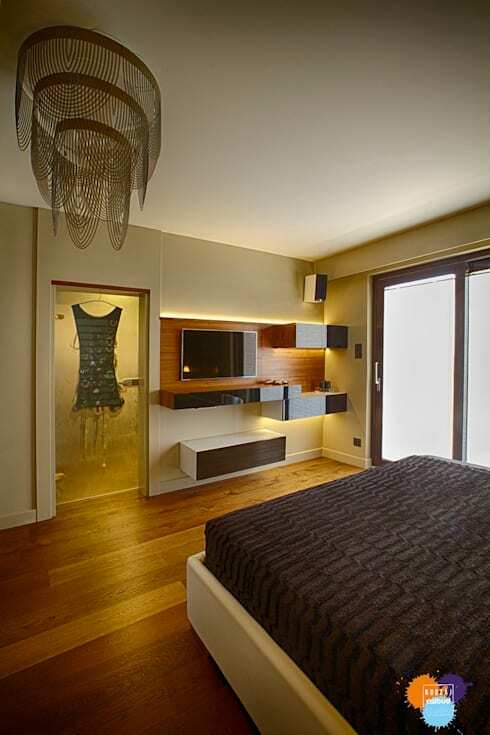 It allows the room to allow for form and function to meet half way. The futuristic idea of this home was embraced wholeheartedly in the kitchen where so many space age design elements were introduced and taken in completely. The kitchen itself is nothing short of gourmet with each aspect carefully planned and thought-out to make it spacious and family friendly too. 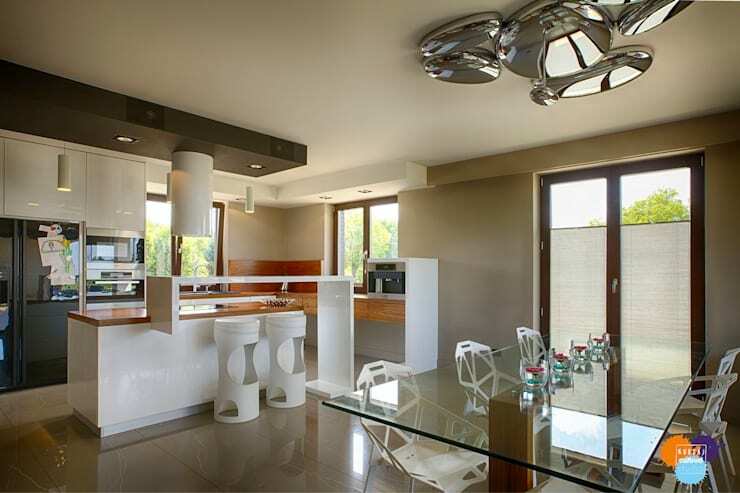 It allows for an uncluttered, yet elegant appearance and with the adorable addition of the futuristic looking bar stools, this kitchen is unmatched in style! Moving on to the dining area we again see the dramatic yet fascinating polished silver lights on the ceiling, calling for adoration. While the dining space itself has enough natural sunlight to make it comfortable during the day. The addition of the transparent glass table creates an illusion of an even bigger space, while the inclusion of oddly shaped white geometric chairs, completes the galactic detail of this space even more. A bedroom is a space to relax, unwind and hide away from your daily troubles, and while this entire house might transport you to a different universe, it doesn't mean that this bedroom needs to be left behind in that same décor, design and style aspect. The completely unconventional and futuristic aspects have been passed on to this inner sanctum too, with the varied colours of walls and ceiling remaining neutral, the sliding glass door of the bathroom accentuates that space-ship feeling. While the floating shelves against the wall are perfectly modest, modern and minimalist, making for an uncluttered and tidy bedroom. The ambience of this bedroom is cosy and warmth and the addition of the funky ceiling light allows this room to maintain the same dramatic effect as the rest of the house. For more bedroom inspiration you might like to check out: How To Make Your Bedroom More Romantic. This living room represents everything that is a positive utilisation of space, with no missing essential elements and the incorporation of neutral and natural tones, while remaining different and fascinating. The living space is bright and airy with well-positioned furniture. 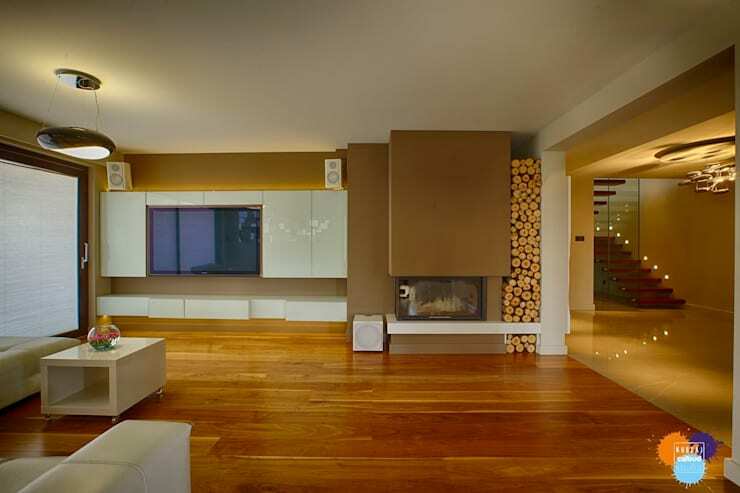 The fireplace is an absolute dream and almost looks like a work of art, it is built into the wall of the home and even has enough storage space for wood and other fire equipment close by, plus doesn't it just add more of a homely effect to the room? Again we see that polished silver light fixture adding that outer space element to this home! The stunning TV screen and perfectly placed surround sound makes this living room a media room too, with enough attractions to make this house so special. The polished white cabinets on either side make a great hiding place for any other HD appliance, adding to that minimalist look. Who needs movie night at the cinema, when you can have your own cinema style movie night at home? A change in colour compared to the natural wooden tones used in the rest of this home, the bathroom certainly has space age written all over it. From the fancy above the counter ceramic double sinks to the modern faucets and fittings. 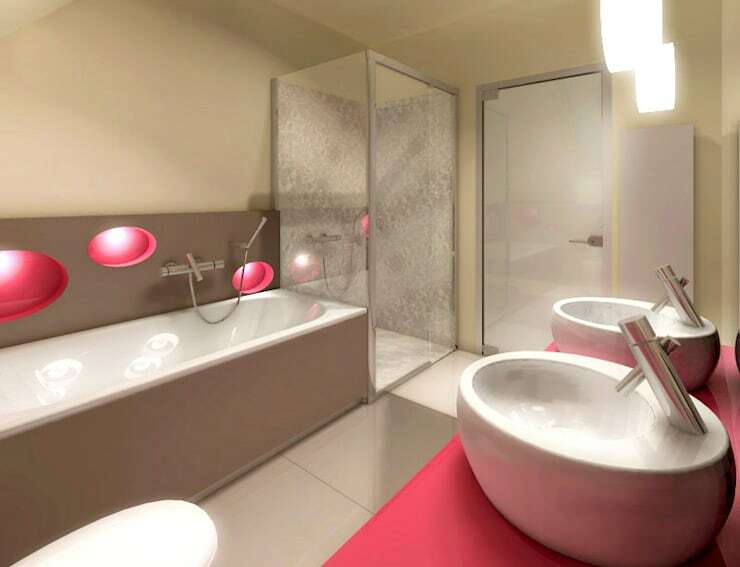 This bathroom seems like it is straight out of a science fiction movie! Although this dramatic approach has been brought into each and every corner, it was done tastefully and with a style and character that only the most daring can pull off! How about that bubblegum pink counter top? And oval shaped pink lights above the bath tub? Not only dramatic, but also striking at first glance! The pink with the neutral grey tone of the tiles and bath tub certainly makes it pop even more! But with the simple and elegant shower and polished white bathroom door, this space is not over the top or even overdone. It is simply just complete. What did you think about this extraordinarily different home interior?